Behind that was a series of small businesses that it turns out are part of something called the London Food Incubator; a building that charges local business folks modest rents so they can make a living and enliven an area that’s seen its share of hard times. There was a cool coffee roasting spot, a casual place selling locally made jams, and a place called Urban Oven that sells gluten-free bread you can bake at home. I kept wandering around thinking, “This is London?” I mean, I had no idea. And I’m a Toronto-based guy who’s been a full-time travel writer for nearly a decade and has traipsed all around Canada and some pretty cool parts of the world. Yet I didn’t know this part of London existed. I can see how this would start the Toronto “centre of the universe” jokes, but at least I know about the area now. And it’s a great story; with committed locals putting their money (what they have of it) where their mouths are and investing in a part of the city that’s suddenly emerging as THE hot and trendy part of a big Canadian city. 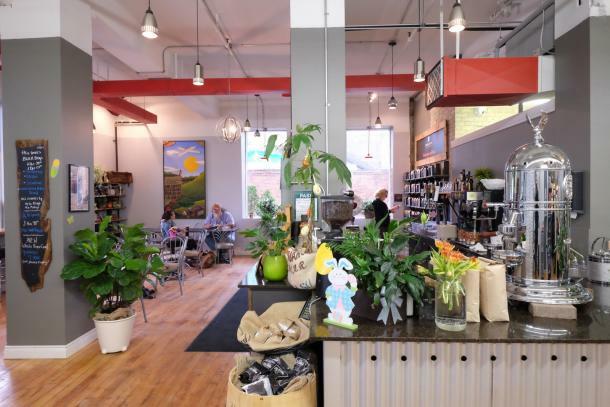 The London Food Incubator is where I discovered Old East Village, and it’s probably the best place for visitors to begin because of its variety, and its tasty food. “I think we’re seeing a strong movement (in London) and a real awareness about using local, organic products,” said Kim Banman, who runs Urban Oven in the Incubator complex. Across the street is a relatively new vintage spot called Room Service Vintage. 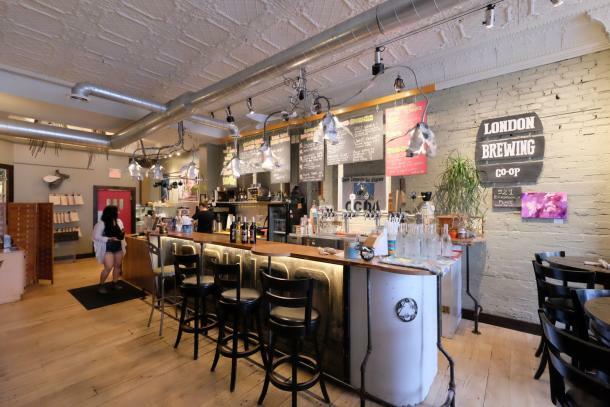 Owner Ben Hoover had been running his business in the nearby town of Lucan but came back to London because he liked the vibe in Old East Village. The block also contains the London Clay Art Centre, a beautifully restored building where folks make lovely pottery and sell it at prices you won’t see in bigger Canadian cities with higher rents. I’m told there’s only one employee and that everyone else is a volunteer. They also use geothermal heating, thus upping their trendy factor by another notch or two. Also on the block is a place called Mystic bookshop, the London Skateboard Co-operative and a Japanese creperie restaurant (they make crepes in Japan? Who knew?). 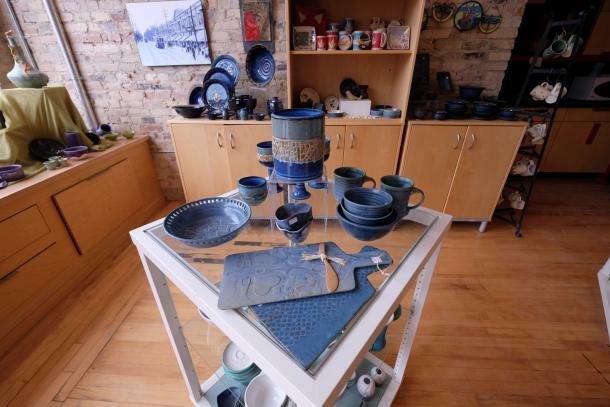 There’s a new gallery coming in next door to Room Service Vintage, and there’s also a distillery on the way for the block. Further down the road is True Taco, where a Mexican-Salvadorean family makes tacos and pupusas and other dishes from Mexico and El Salvador. The food is tasty, the portions large and the prices extremely reasonable. I stuff myself silly on three different items that I can’t even finish and walk out just $13 poorer. I didn’t have time to stop, but I also found restaurants on Dundas specializing in Thai, Ethiopian and other cuisine. Talk about your Canadian mosaic. Down at The Root Cellar, a wonderful restaurant across the street from the Food Incubator, the focus is very much on local food. There’s even a map in the dining room showing folks where their meals came from. 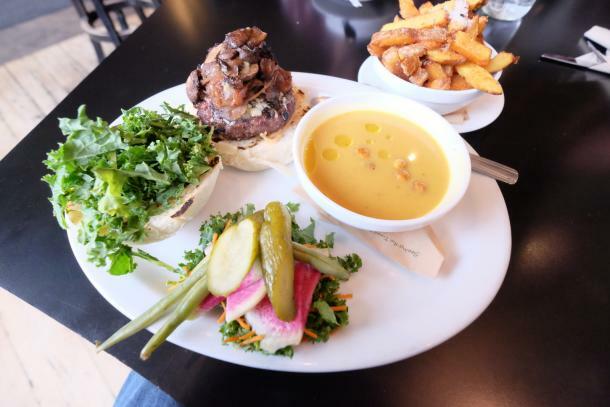 I made it there for lunch and had a wonderful water buffalo burger (surprised again) that came from an Amish farm just a few clicks from downtown London. Of course. One of the wait staff tells me customers who have a bit of cash to spare can put a few bucks in a community jar. The restaurant staff uses the money to pay for a salad or a coffee for folks in the area who can’t afford to dine out. The main restaurant is super cool, with fun, overheard lights that look to me like twisted, metal tulips. 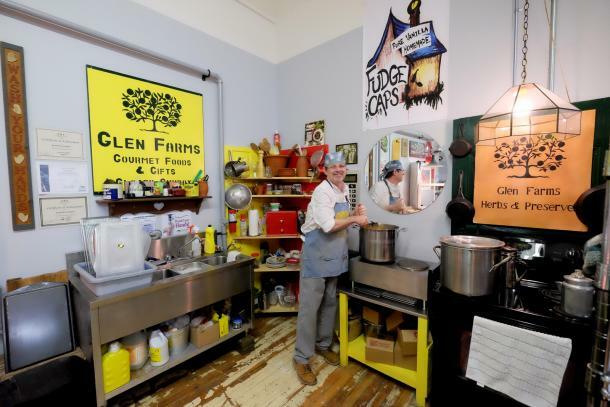 There’s an event space upstairs where they do special meetings, such as a dinner where local farmers come in to dine and talk about their food or where they have workshops on everything from bees to flower-arranging. One of the recent success stories in London is Illbury + Goose. It’s a trendy clothing and accessories spot on Dundas St., just across from the Western Fair Farmers’ and Artisans’ Market. 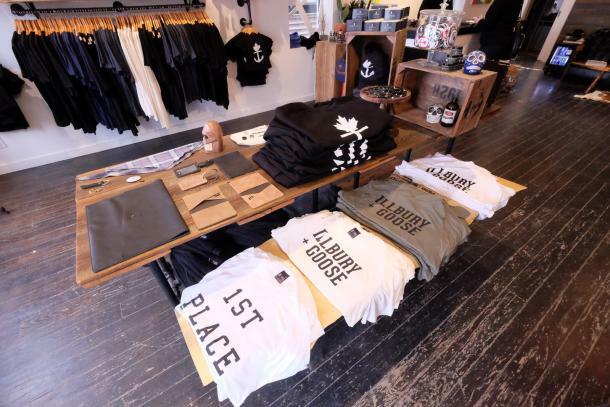 They sell sleek, millennial-friendly t-shirts as well as lumberjack shirts, beard oil and toques with the names of London neighborhoods on them. Next door is The Hungary Butcher, where they make some 50 types of gluten-free sausages and also sell local eggs and locally smoked, fabulous looking bacon. All the meat comes from within an hour’s drive or so. Just past The Hungary Butcher is All ‘Bout Cheese, where you can find local Gunn’s Hill cheeses and fromage from around the world, including a stilton with mango and ginger and a goat gouda with garlic that’s perfect for alliteration addicts. Craft beer is a huge deal in London these days. I tried great beer at Toboggan Brewing in downtown London a couple years ago. 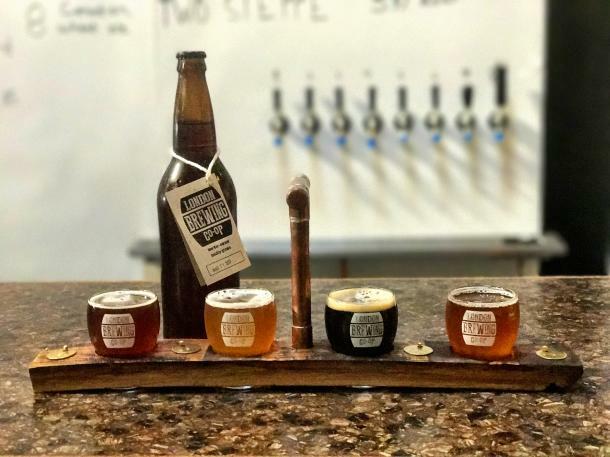 This time, I sampled tasty brews at Anderson Craft Ales, where they also bring in local food trucks, and at worker-owned London Brewing Co.. Both Anderson and London Brewing are in industrial/residential area a bit east of the farmers’ market. 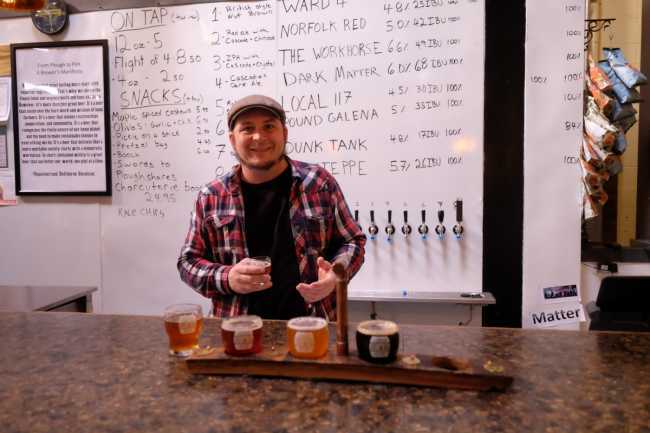 London Brewing’s Jeff Pastorius, who also helps run The Root Cellar and is kind of an unofficial spokesman for London’s organic and local food movement, says the emphasis here also is on southwest Ontario products; locally-grown hops and malts and grains. Their Local 117 beer is so-named because all the ingredients come from within 117 km’s, and that’s impressive. It’s also a nice introduction to craft beer from folks who might think most craft brews are too strong. Pastorius said they get all varieties of people into the shop; everyone from folks in a flashy Mercedes to young folks on their beat-up bikes. Out back, past the brewery’s spacious tasting room, you’ll find On The Move Organics, which delivers wholesome and mostly local foods to area residents. They’ve built a massive bike out of spare parts that can hold more than a dozen food baskets, and how’s that for eco-friendly? After my dinner at True Taco, I took in a marvellous show featuring Joel Plaskett and his dad, Bill, as well as a fun duo called the Mayhemingways who really got it going with soft drums, banjo, guitar and an accordion. The show took place at London’s Aeolian Hall, a wonderful venue on Dundas Street with some of the best acoustics in the country. Again, it’s largely run by volunteers, which speaks to the commitment people have to the area. I spent the night at the lovely Idlewyld Inn and Spa, located in a quiet, residential area just south of downtown. 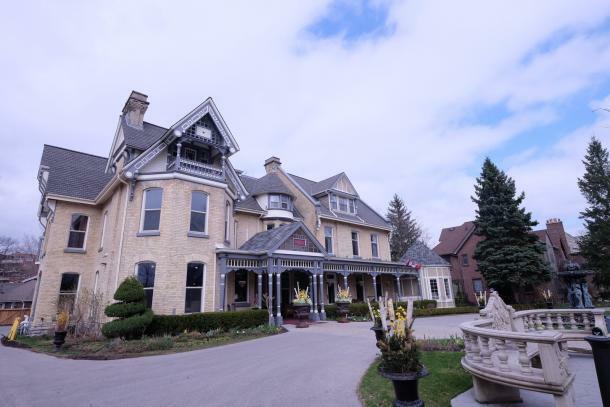 There are lovely gardens out front and it’s been wonderfully restored, with gleaming turrets and lacy Victorian-style bits that give it real character. I didn’t have a chance to eat at the restaurant, but it’s a lovely space with huge windows and bold, bright paintings. My room had a peaked ceiling and a large bathroom with great amenities and a small bay-style window with a long cushion that I laid down on for a short rest. It’s a homey yet elegant and quiet retreat in a city that has more than its share of things to do. And, judging by the looks of things, plenty more to come. To read more about Jim Byers&apos; Travels, visit his website here.